Are you looking for a gaming keyboard? This article is written for you. We are going to present you the top 3 of 2018 gaming keyboards, specially designed for FPS and especially games like Fortnite, Counter-Strike, PUBG, or H1Z1. We will analyze the keyboards most used by professional players while explaining why they chose these products. Switch Types, anti-ghosting technology, actuation force and activation distance, we’ll all explain. If you are in a hurry, buying one of these three keyboards will inevitably be a good choice, go for it. 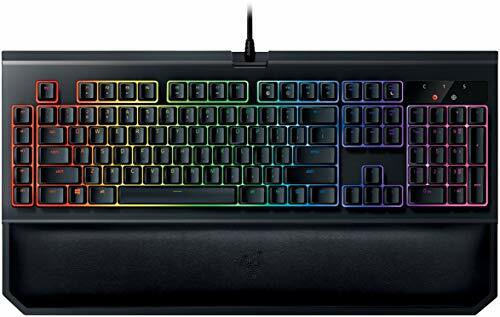 Key technology: Cherry MX/backlight: Yes, RGB/Multimedia shortcuts: YES/macro shortcuts: Yes/Anti-ghosting: Yes/simultaneous input of keys: Yes/connection required: 2 USB ports/USB port (s): Yes/MAX polling frequency: 1000 Hz. 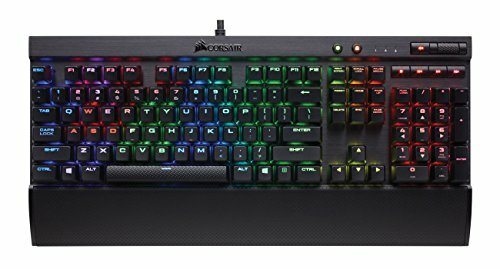 It is the mythical keyboard that made the fame of Corsair in Gaming. High-end keyboard of the Corsair brand, the K70 is a mechanical-type keyboard and features anti-ghosting technology. This is a keyboard that we regularly find at professionals. The mechanical keys are Cherry MX, and one can choose its favorite model from all available versions: Blue, Red, Brown or even Speed. Corsair K70 also has the advantage of having a comfortable rubber wrist rest that allows you to spend long hours playing without suffering on the wrists. In terms of material quality, the chassis is Matt Aluminium, which is perfect for durability and long term resistance. The keys are reactive and do not fade easily. If you really want to be able to personalize the colors of the keyboard, opt for the RGB version. If in contrast, a classic backlight is enough for you, the standard version is perfect and will make you save money. Key technology: Razer Green (also available in Razer Orange version)/backlight: Yes, RGB, key by key/multimedia shortcuts: Yes, shared/Macro shortcuts: Yes/Anti-ghosting/simultaneous consideration of keys: Yes, 10KRO/ Connection required: 2 USB ports, 2 audio ports/USB port (s): Yes/MAX Polling frequency: 1000 Hz/ Audio port (s): Yes. The most high-end keyboard of the Razer brand is the famous BlackWidow Chroma, which has quickly established itself as one of the best gamer keyboards in the market following its excellent hardware quality and advanced features. The metal gives the keyboard an extremely durable, long-lasting matte finish, very handy to ensure that its keyboard is able to withstand the years of use it will undergo. The RGB, as for it, allows to personalize a lot and very simply the backlight of the keyboard. This personalization is done using a software provided by Razer, which has the advantage of being very simple and very convenient to use. In the key mechanism, the green switches are similar to the blue switch of Cherry MX. So they are “clicking” and you can type in text very quickly with little effort. They also make a lot of noise, what you like or what you don’t like. If the noise really disturbs you, it is better to orient yourself to the Razer Orange or Yellow. But if you like it, then the Razer Green will surely please you. 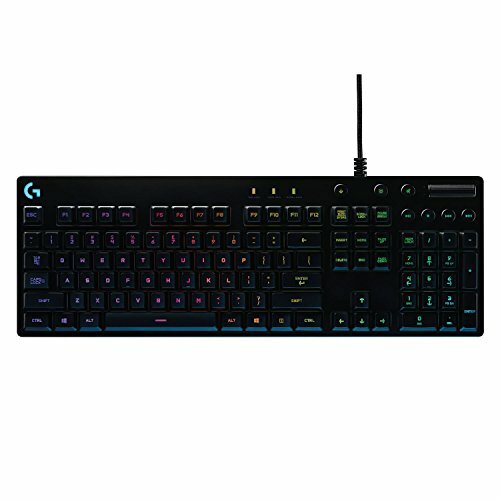 Key technology: Logitech Romer-G/backlight: Yes, RGB, key by key/Multimedia shortcuts: YES/Macro shortcuts: no/Anti-ghosting/ simultaneous consideration of keys: Yes/connection required: 1 USB port/USB port (s): no/ MAX Polling frequency: 1000 Hz/ Audio Port (s): No. This is the mechanical keyboard used by professional Counter-Strike teams (including CLOUD9). Logitech uses its own switch technology (Romer-G). Sober, solid, well designed and quiet enough for a “mecha“, it fixes most of the disappointing aspects of the G910. It’s a relatively quiet keyboard. For the negative points, we regret the lack of USB port, macro keys and the wrist rest. A switch is said to be linear or tactile depending on its sensitivity. Thus, a keyboard with touch switch will have a much more flexible touch back than a linear switch. This makes it possible to “feel” when a key has been activated or not. For gaming, the difference is not paramount and is more akin to a game comfort, the linear switch assuring you that your skill has been launched. Standard 2 mm on the Cherry MX, this means that the key will have been considered depressed once it has travelled 2 mm. Note that the maximum driving distance for a key is 4 mm. This is the required pressure on a key to push it to its activation distance (2 mm). A light weight makes activation faster, as a touch is enough. A high force will protect you from a missed click at the fateful moment. The higher the strength, the greater the “stiffness” sensation of a key. The mechanical keyboards produce an audible rattle. With respect to the Cherry MX, all make the same noise, with the exception of the blue switch, more pronounced. A difference in sound can be felt between two keyboards with the same switch. This is explained by the materials used for the rest of the keyboard and a possible resonance effect. Some mechanical keyboard switches are designed to give you a “click” exactly when a key has been pressed. This “click” allows you to identify the force required to press the key. Because it is not always necessary to go to the bottom. Because when you’re not used to it, you can be a nuisance following the effort of pressing the keys to the bottom each time. But with a little time and usually, this little click if you pay attention will allow you to gain in speed, because your way of typing will be lighter. Ensures that you can press a multitude of keys at the same time without causing errors in the interpretation of pressed keys.